PARTYGOERS can light up their love lives next month at one of the North East’s best-loved venues. 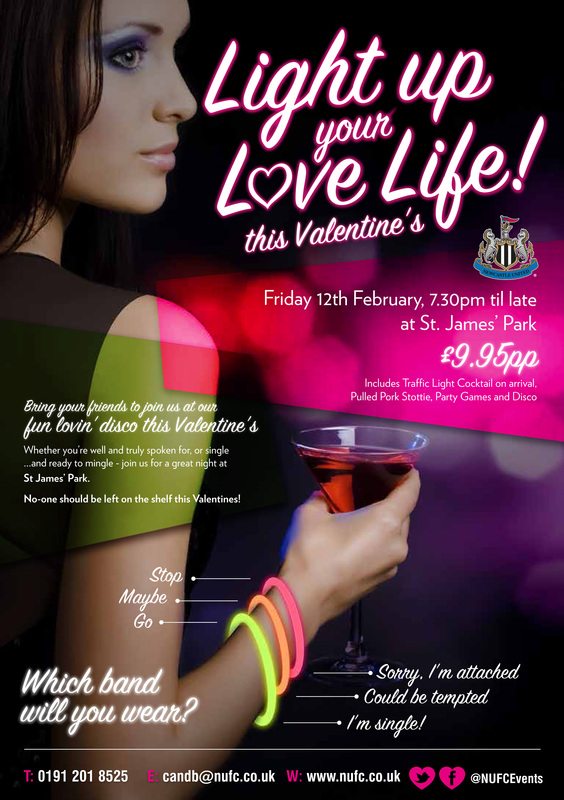 St James’ Park – home to Newcastle United – is holding a special, ‘traffic light’ Valentine’s party on Friday, 12 February, when those looking for love can give the green light to romance. Guests will be given a green, amber or red coloured cocktail on arrival before taking their pick of three, illuminated coloured wristbands – which will signal their status to would-be admirers. In the code of the romantic road, a red band will indicate the wearer is attached, an amber – or orange – band will indicate they could be tempted and a green band will show they are single and ready to mingle. The Light Up Your Love Life event will begin at 7.30pm and the £9.95 ticket price includes the arrival cocktail, a pulled pork stottie, party games and a disco.